Chris Harris took his chance in Europe last season with four tries in seven Challenge Cup games. Director of rugby Dean Richards says Newcastle Falcons' young players will be considered for the first XV if they impress in the European Challenge Cup. Richards has selected a number of academy players in the European squad, having seen Tom Penny and Chris Harris emerge in similar fashion last season. Falcons have lost all four Premiership games so far this season. "It hasn't worked for the guys who started the last few weeks," Richards told BBC Newcastle. "So it means the guys who come in have a great opportunity. "Who's to say if they win and they play well, they won't start in the first-team against Sale in a few weeks?" 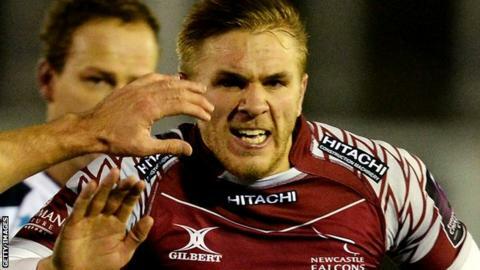 Harris, in particular, was a stand-out player in Falcons' 2014-15 European Challenge Cup fixtures, scoring four tries in seven games and a further four tries in six appearances in the Premiership last term. Tom Penny has been another academy find from Newcastle's European adventures. Falcons have been placed in a group with early Pro-12 pacesetters Connacht, familiar European opponents Brive and a relatively unknown quantity in Russian League side Enisei-STM from Siberia. "They are going to be flat out games, quite difficult," Richards added. "It's interesting these teams are doing well, probably because a lot of the other sides lost players to the World Cup. "It means these sides are on fire, playing with a lot of cohesion, it'll be a great challenge as it is who you want to pit your wits against."